The use of ceramics in biological environments and biomedical applications is of increasing importance, as is the understanding of how biology works with minerals to develop strong materials. 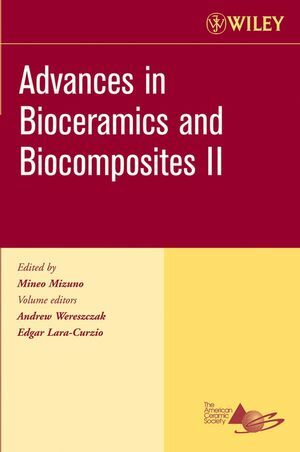 These proceedings contain papers that discuss the interface between biology and materials, presented at the Proceedings of the 30th International Conference on Advanced Ceramics and Composites, January 22-27, 2006, Cocoa Beach, Florida. Organized and sponsored by The American Ceramic Society and The American Ceramic Society's Engineering Ceramics Division in conjunction with the Nuclear and Environmental Technology Division. Edgar Lara-Curzio is a Distinguished Research Staff Member and the leader of the Mechanical Properties and Mechanics Group at Oak Ridge National Laboratory. Since 1999 he has been serving as leader of the Mechanical Characterization and Analysis User Center in ORNL’s High Temperature Materials Laboratory. Lara-Curzio received a B.Sc. degree in Engineering Physics from the Metropolitan University in Mexico City in 1986 and a Ph.D. in Materials Engineering from Rensselaer Polytechnic Institute, Troy NY, in 1992. Initial In Vitro Interaction of Human Osteoblasts with Nanostructured Hydroxyapatite (NHA) (Xingyuan Guo, Julie Gough, Ping Xiao, Jing Liu, and Zhijian Shen). Osteoblast Response to Zinc-Doped Sintered p-Tricalcium Phosphate (Sahil Jalota, Sarit 8. Bhaduri, and A. Cuneyt Tas). Hydroxyapatite Hybridized with Metal Oxides for Biomedical Applications (Akiyoshi Osaka, Eiji Fujii, Koji Kawabata, Hideyuki Yoshirnatsu, Satoshi Hayakawa, Kanji Tsuru, Christian Bonhornrne, and Florence Babonneau). Preparation of Self-setting Cement-Based Micro- and Macroporous Granules of Carbonated Apatitic Calcium Phosphate (A. Cuneyt Tas). A Self-setting, Monetite (CaHPO,) Cement for Skeletal Repair (Tarang R. Desai, Sarit B. Bhaduri, and A. Cuneyt Tas). Chemically Bonded Ceramics Based on Ca-Aluminates as Biomaterials (L. Herrnansson and H. Engqvist). A Theoretical and Mathematical Basis Towards Dispersing Nanoparticles and Biological Agents in a Non Polar Solvent for Fabricating Porous Materials (Navin J. Manjooran and Gary R. Pickrell). Preparation of Hydroxyapatite and Calcium Phosphate Bioceramic Materials from the Aqueous Solution at Room Temperature (Jia-Hui Liao, Yu-Chen Chang, and Tzer-Shin Sheu). Hydroxyapatite Coatings Produced by Plasma Spraying of Organic Based Solution Precursor (E. Garcia, Z. B. Zhang, T. W. Coyle, L. Gan, and R. Pilliar). Visible-Light Photocatalytic Fibers for Inactivation of Pseudomonas Aeruginosa (P. G. Wu, R. C. Xie, J. Irnlay, and J. K. Shang). Precipitation Mechanisms of Hydroxyapatite Powder in the Different Aqueous Solutions (Yu-Chen Chang and Tzer-Shin Sheu). Conversion of Bioactive Silicate (45S5), Borate, and Borosilicate Glasses to Hydroxyapatite in Dilute Phosphate Solution (Wenhai Huang, Moharned N. Raharnan, and Delbert E. Day). Variable Frequency Microwave (VFM) Processing: A New Tool to Crystallize Lithium Disilicate Glass (Morsi Mahmoud, Diane Folz, Carlos Suchicital, David Clark, and Zak Fathi).